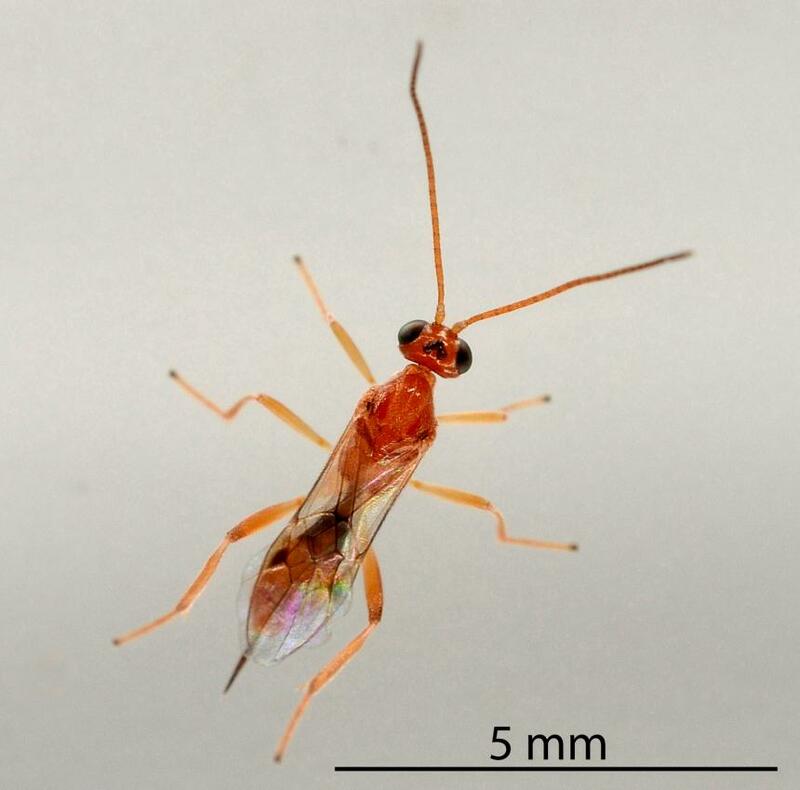 This adventive wasp was first identified in New Zealand by Dr J Berry in 1996. This parasitoid of caterpillars had probably been in New Zealand for at least a year. It is found throughout western Europe, North Africa, China and Japan. It is now found throughout New Zealand. 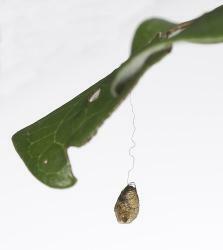 It has a distinct cocoon that hangs from a thread. Its hosts include indigenous and adventive species of moths. Conservation status: Widespread in forests, parks and open habitats. 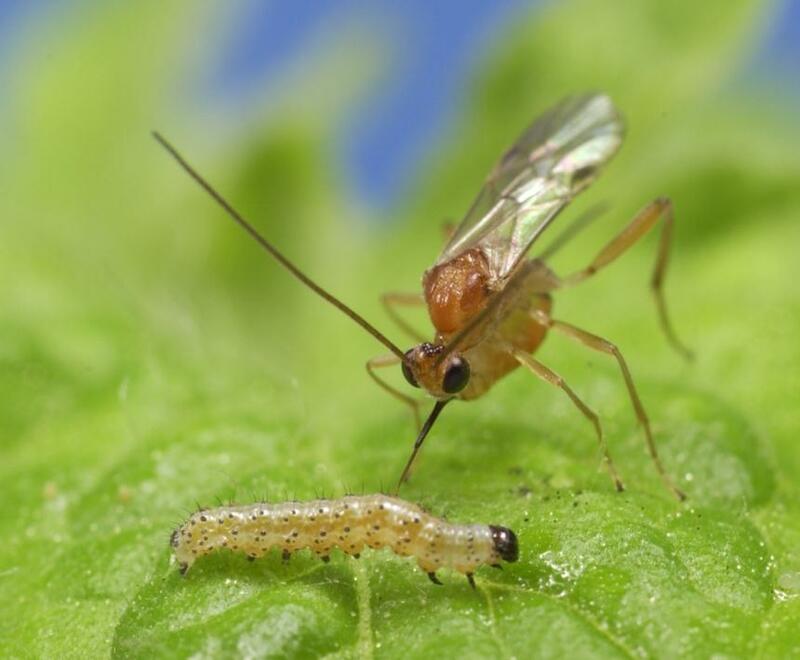 It contributes to the biological control of adventive moths that are pests of crops and parasitises native species. The parasitoid breeds all year in Auckland, and it may also breed all year in colder parts of the country. Only females have been found in New Zealand. 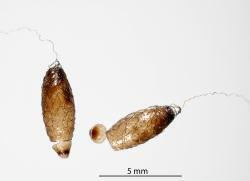 They are thelytokous, a form of parthenogenesis where the females can lay fertile eggs. The adult females are 4.5-5.0 mm long. They are orange-brown with dark, narrow, basal abdominal segments. The first segment of the abdomen is very narrow and black. The legs (3 pairs) are also orange-brown, but may have darker areas. The head has two black compound eyes, prominent ocelli (small single-lens ‘eyes’) and a pair of long brown antennae. Like all wasps, the adults have two pairs of wings. They are transparent with prominent veins and one dark area on the leading edge of the forewing. This dark area and the size and shape of adjacent areas (cells) are useful for the identification of the species. 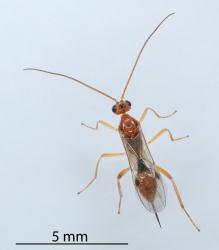 The female has a prominent long dark ovipositor at the end of the abdomen. 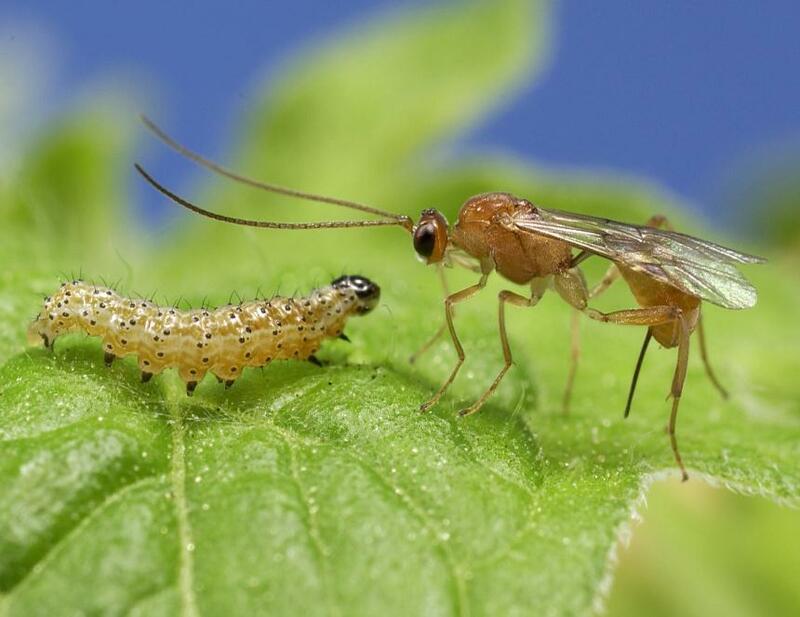 Female wasps locate free-living caterpillars and lay one egg in each. The egg in the caterpillar hatches. 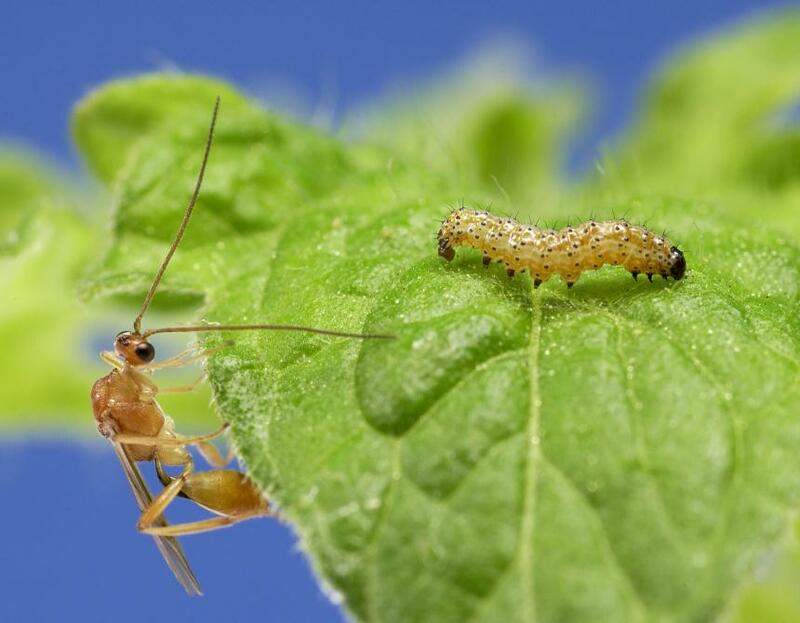 The wasp larva lives in the caterpillar, feeding without harming its host, which continues to grow. 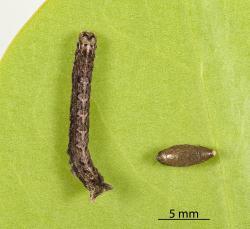 When the wasp larva is fully grown, it makes an exit hole in the skin of the still-living caterpillar. 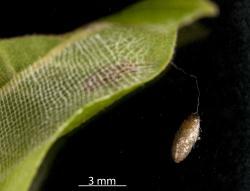 The wasp larva attaches a thread to the leaf or other surface and weaves it around itself, forming the basket. It then makes a hard, oval, shell-like cocoon from fine silk. The cocoon is a light shade of brown and about 5-10 mm long. It pupates within the cocoon. When the adult is fully developed, it hatches within the cocoon. When its body has hardened, it cuts open the top of the cocoon and emerges. 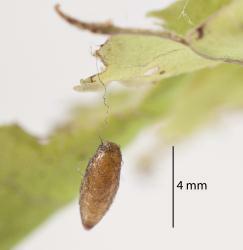 Identification of adult Basket-cocoon parasitoids require specialist knowledge. Des Helmore's drawing of adult females in the paper by Berry and Walker (2004) illustrates important characters. 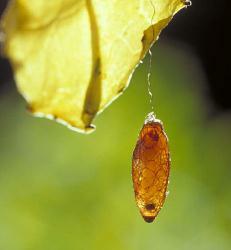 The basket pupa hanging on a thread is distinctive and unique in New Zealand. 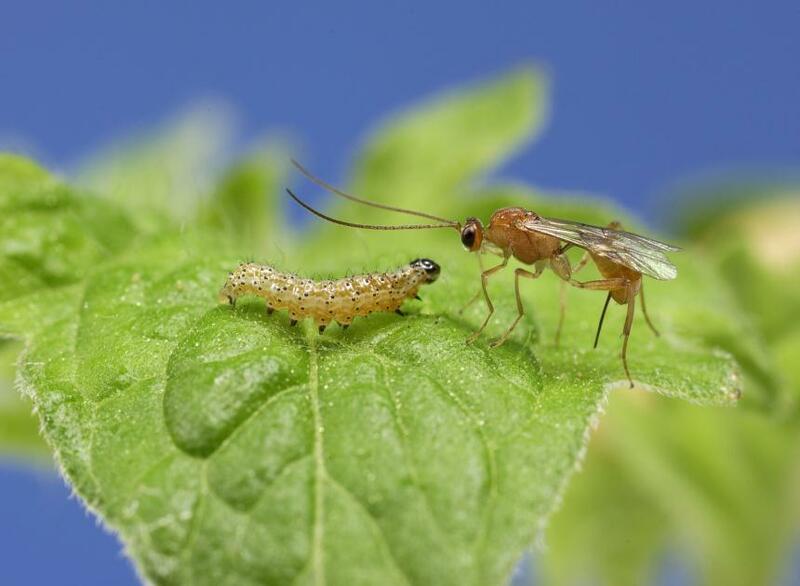 This makes it easy to identify if it is the parasitoid of a caterpillar. 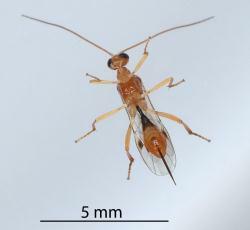 No pathogens, parasitoids or predators of Meteorus pulchricornis are known in New Zealand. The adults are probably caught by predatory insects, spiders and birds. The adult female wasp locates free living caterpillars and lays an egg in each one. In New Zealand caterpillars in 12 families have been recorded as hosts of the basket-cocoon parasitoid. Worldwide the basket-cocoon parasitoid has a wide host range. At the time of its detection in New Zealand, Berry and Walker (2004) reported that hosts were known from 11 Lepidopteran families. Table: New Zealand hosts of Basket-cocoon parasitoid, Meteorus pulchricornis, (Wesmael, 1835) (Hymenoptera: Braconidae), from the Plant-SyNZ database (20 July 2018). The reliability score shows the quality of evidence for the host association (0-10, 10=high quality). Most insects require males to mate with a female to produce fertile eggs. However, in some insects this is optional for some or all of the time. Biparental insects are called arrhenotokous. 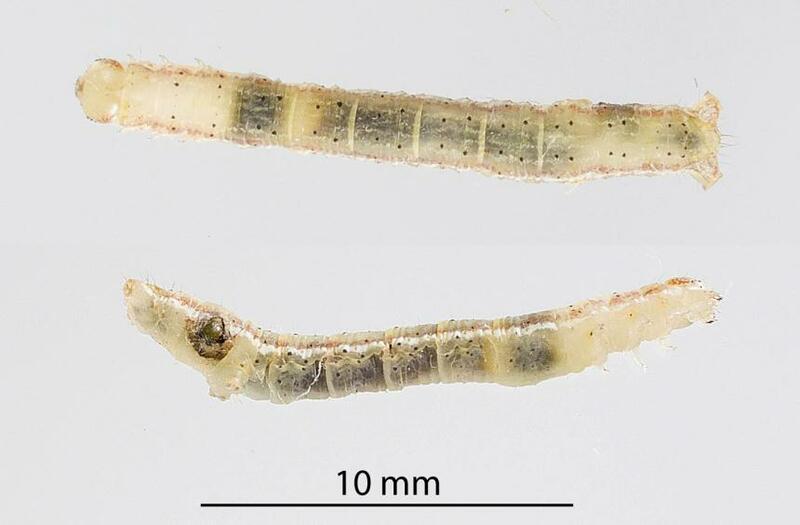 Female-only strains of a species are thelytokous, uniparental. Only females of the Basket-cocoon parasitoid, Meteorus pulchricornis, have been found in New Zealand, so our local strain is thelytokous. Thelytokous Meteorus pulchricornis,are the main form found in Asia, while those in Europe are biparental. It is therefore most likely that the Basket-cocoon parasitoids in New Zealand came from Asia, although it is possible that they came from elsewhere and were from a minor thelytokous strain. Berndt LA, Berry JA, Brockerhoff EG. 2006. Parasitoids and predators of the endemic defoliator Pseudocoremia (Butler) (Lepidoptera: Geometridae: Ennominae). New Zealand Entomologist. 29: 89-98. Berry JA. 1997. Meteorus pulchricornis (Wesmael) (Hymenoptera: Braconidae: Euphorinae), a new record for New Zealand. New Zealand Entomologist. 20: 45-48. Berry JA, Walker GP. 2004. 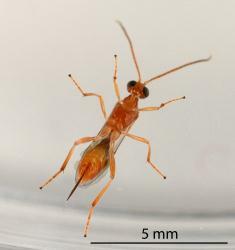 Meteorus pulchricornis (Wesmael) (Hymenoptera: Braconidae: Euphorinae): an exotic polyphagous parasitoid in New Zealand. New Zealand Journal of Zoology. 31 (1): 33-44. Burgess EPJ, Kean AM, Barraclough EI, Poulton J, Wadasinghe G, Markwick P, Malone LA. 2014. Evaluation of the impacts of simulated Bacillus thurengiensis-transgenic Pinus radiata on nontarget native Lepidoptera and their natural enemies in a New Zealand plantation forest. Agricultural and Forest Entomology. 16: 63-74. Guthrie RJ, Sullivan JJ, Buckley HL. 2008. Patterns of host damage by the cabbage tree monophage Epiphryne verriculata Feld (Lepidoptera: Geometridae) across urban, rural and native forest habitats. New Zealand Entomologist. 31: 77-87. Mansfield S, Kriticos DJ, Potter KJB, Watson MC. 2005. 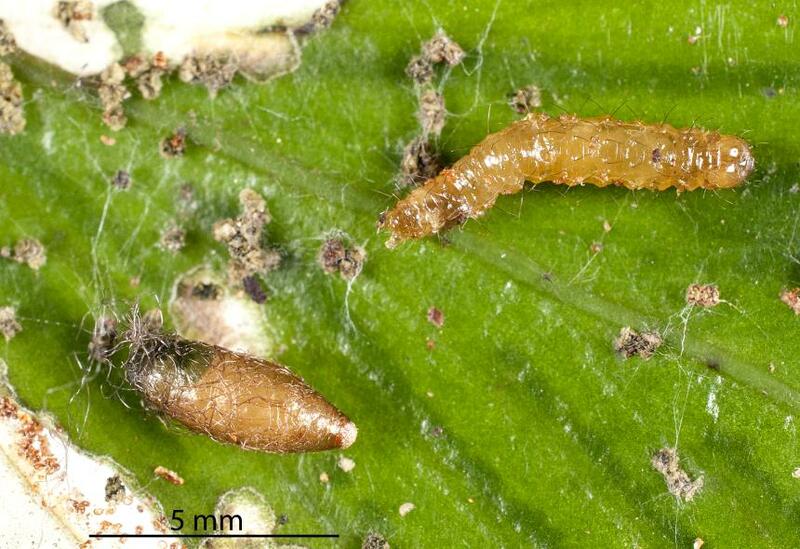 Parasitism of gum leaf skeletoniser (Uraba lugens) in New Zealand. New Zealand Plant Protection. 58: 191-196. Walker GP, Qureshi MS, Wallace AR. 2004. 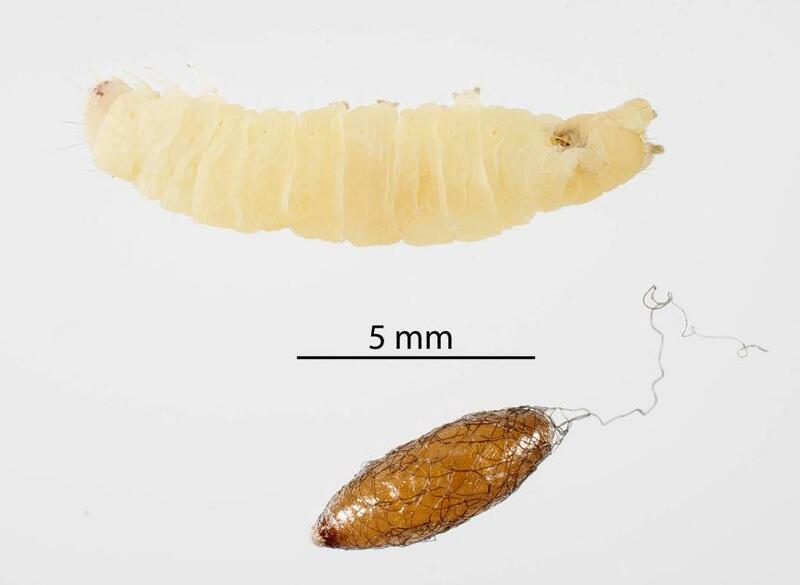 Parasitism of lepidopteran larvae collected from vegetable crops and associated weeds at Pukekohe. New Zealand Plant Protection. 57: 1-7. The New Zealand Institute for Plant & Food Research Limited (Plant & Food Research) for funding via the Better Border Biosecurity (B3) research collaboration. Frances MacDonald and Dominic Hartnett (Plant & Food Research) for information about collections of parasitoids and hosts. 1 August 2018, NA Martin. Host list updated, Nyctemera annulata, added. Walker GP, Martin NA. 2017, revised 2018. Basket-cocoon parasitoid - Meteorus pulchricornis. Interesting Insects and other Invertebrates. New Zealand Arthropod Factsheet Series Number 67. http://nzacfactsheets.landcareresearch.co.nz/Index.html. Date Accessed. ISSN 1179-643X.